The nuts always came from up north. Walnuts, almonds, cashews & raisins. They were exotic & expensive. Mostly my aunt brought them. When she came to visit us. She would bring out bags of nuts. In hand stitched cloth bags. Made from up-cycled bits & pieces. She would stock up during winter. And bring bagfuls in summer. We mostly ate them raw. The whole family gathered together. My mother would store away some. To be used in cooking. Till date I think nuts are special. 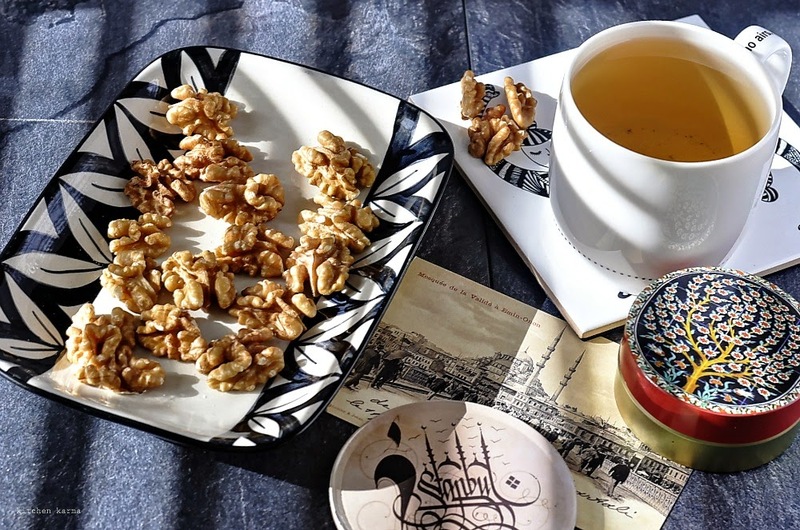 During our trip to Istanbul last year I had picked up some walnuts. We mostly ate those as a quick snack or sprinkled over morning granola/oats. A few days back I realised that they were going a little stale. So I decided to use them up. 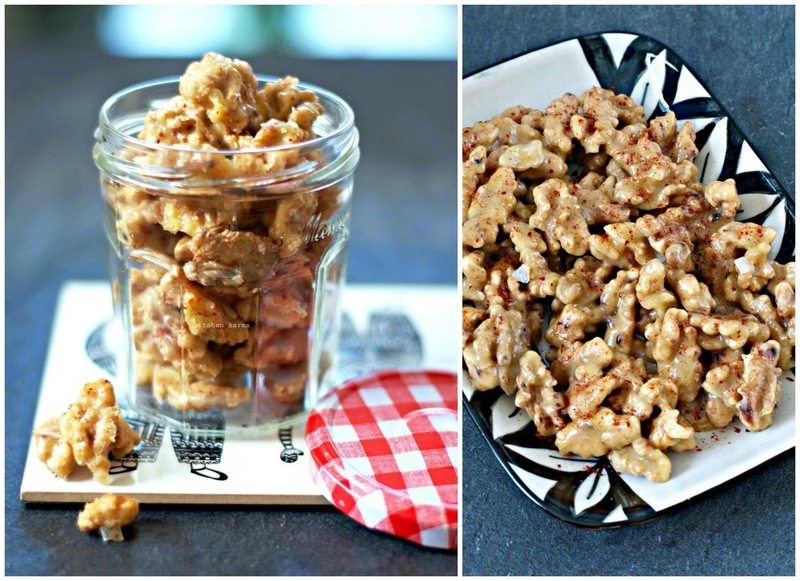 I had some home made butterscotch sauce in my fridge, I decided to make candied walnuts using that sauce. 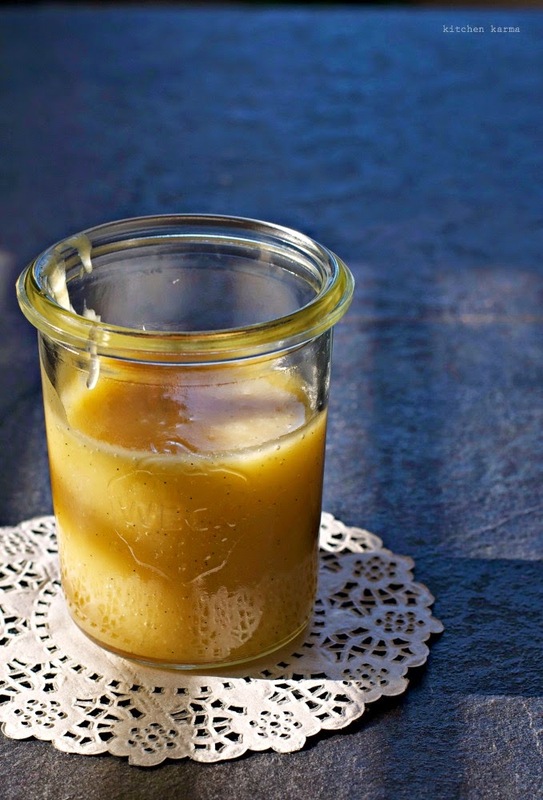 If you have the sauce all ready, it is a super easy recipe to make. But first let's make the sauce. It's a sauce I am addicted to. I keep making it and use it on cakes, cheesecakes, ice cream, hot buttered toast, popcorn. You name it, I have poured this sauce on it and it tastes oh so good. 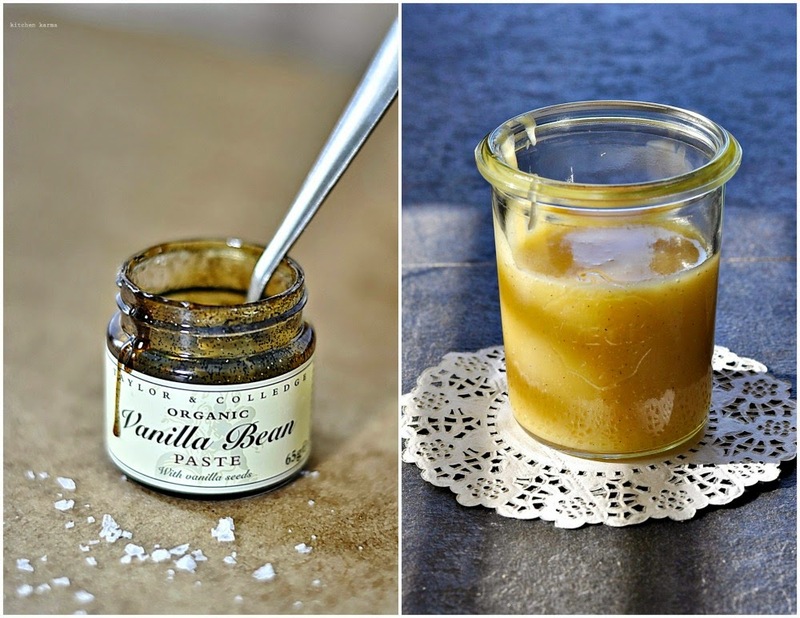 Or if you are like me, you would just sneak open your fridge and eat a spoonful of this sticky sauce which smells of vanilla, oozes butter and cream. Once you make this sauce, I promise you, you will never buy store bought ones ever again. I found the recipe here in Smitten Kitchen's blog. She in turn found it from another source. To help me get exact 1/4 cup of butter, I started by taking 2 table spoon of butter in my measuring cup and microwaving for 10/20 seconds, once the butter melts, it's easier to get the measurement correct. Take a heavy bottomed sauce pan, switch on the heat, keep it low, add the butter, sugar and cream and whisk until the sugar melts and everything mixes well and the mixture starts to bubble. Let it cook for about 5/6 minutes and switch off the heat. Then add the vanilla paste and mix well, Do a taste and adjust the vanilla if needed. Let the sauce cool down for at least 10 minutes or so, before adding the sea salt. This way the sea salt does not melt and retains it's crunch. I have stored this in a sterilised glass jar in the fridge for about 5 days or so. But believe me you this will not stay for 5 days. It's a very forgiving recipe, I loosely follow the measurements and it tastes great every time. I have doubled the recipe many times and once halved it. Though it's easier to double it than half it because of the measurements. Now for the candied walnuts. I went through some of the recipes on the internet and then decided to go my own way. I decided to cut the steps short and use my butterscotch sauce which I had originally made for a cheesecake. In a large frying pan dry roast the walnuts. This step is important specially if your nuts are going slightly stale. Not only roasted nuts smell gorgeous, they taste better too and retain their crunch far longer. But be careful while doing this step [talking from experience]. 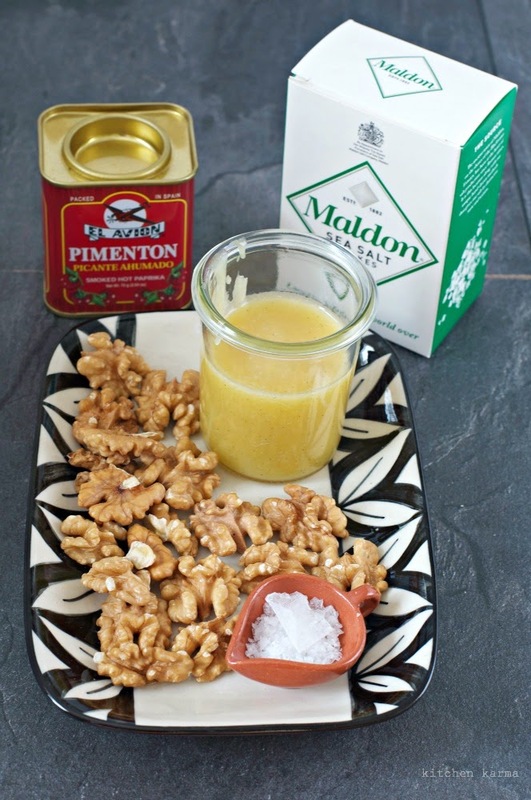 Heat a frying pan, bring the heat right down, add the walnuts and be patient. Initially nothing will happen, but do not loose patience, keep stirring the nuts. After 4/5 minutes the nuts will start smelling roasted. Turn off the heat immediately and let the already heated pan do the rest of the roasting. This keeps the nuts from burning, which they rather easily do. Once you are satisfied that the nuts are nicely and evenly roasted, pour the sauce over them, switch the heat back on, keep it low and mix the nuts with the sauce. Cook for the couple of minutes and switch off the heat. If your frying pan is large enough make sure that the nuts are not overlapping each other. If there is not enough space transfer on a baking tray. Then add the paprika and the sea salt and let the nuts cool down completely before starting to snack. 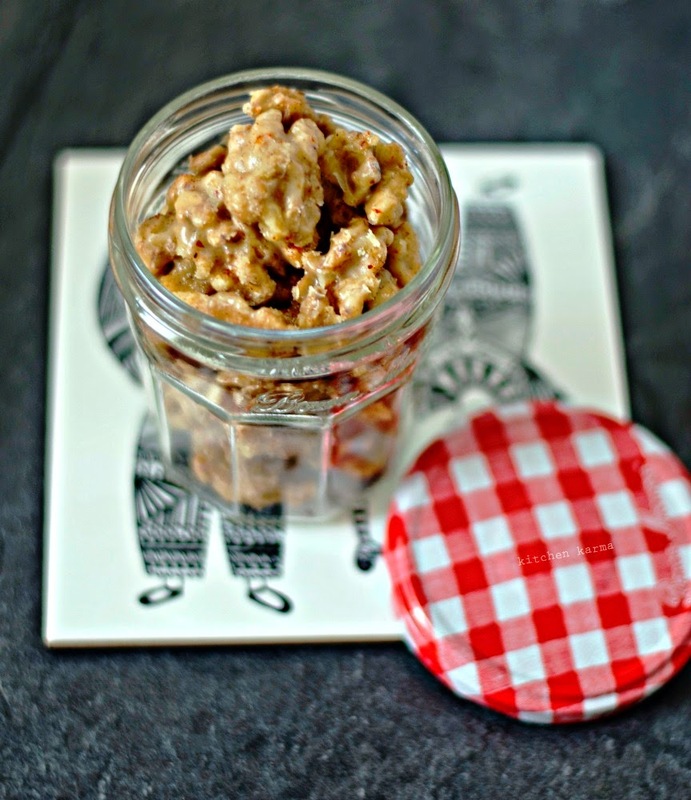 The nuts stay for about a week in sterilised glass jars in the fridge. Adding the sea salt and the paprika gives a savoury and spicy twist to this sweet treat and makes it more exciting to eat. Hi Suchi; love your walnut /butterscotch combo. Perfect little bites! Perfect one. Looks so yummy. Hey, i typed out a long comment but on publishing it logged me out. Hope this one gets through. I agree with the above commenter on the new look of the blog. It's definitely clean and eye catching, but i thought the old one was more you, more vivacious.